Some of you might remember a movie from a few years back that starred Toni Collette (a favourite of mine!) and Cameron Diaz called “In Her Shoes”. Now I barely remember what the movie was about anymore but I do remember how Toni Collette confessed to her perfectly-shaped sister that the reason she bought so many pairs of shoes was because shoes didn’t make her feel bad about herself. They didn’t hang funny, or make her bum look big. They didn’t look great on the rack but terrible on her body. So, when she needed a lift, or wanted to celebrate an achievement, she would buy shoes because trying on clothes was too depressing and because celebrating with cake would make her fatter. Perhaps it seems like a silly thing but the sentiment has resonated with me for years. And I have to admit that a pretty pair of shoes really does do wonders for a girl’s confidence. It is mainly for this reason, the love of shoes reason I mean, that I have fallen in love with the idea of knee / calf length wedding dresses. There is just something so special about having those beautiful feet and shoes on constant display. It’s different (but still gorgeous). If you’re a bit of a less-than-conventional bride then maybe you don’t want to pick out one of those classic princess ball gowns. Shorter gowns can be so cute. Just because you’re going short doesn’t mean you have to give up on the girly lace and frills. A-line skirts are flattering. While that mermaid tail dress might make you look more like a whale than a mermaid, a nice A-line dress can flatter even the most imperfect of figures. Show off your shoes / feet / ankles / calves. Yes I said the thing about the shoes already – but come on! You get to actually show those shoes off! 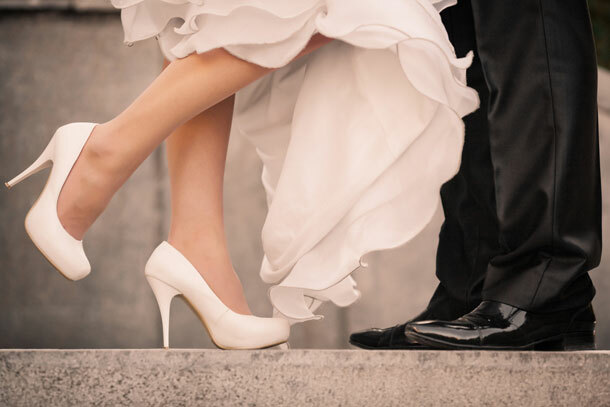 Sure someone might get a hint of your shoes somewhere under that massively frilly floor-length gown, but when your dress is shorter those carefully selected and oh-so-gorgeous shoes will be on constant display. Cute flirty bride feet? Awesome! You are less likely to die of heat stroke. Have you ever walked around all day in the sun taking photographs while in a gown that has seven layers and weighs a ton? For some reason brides don’t feel the cold (think Phoebe getting married in the snow on Friends) but I can guarantee you that they feel the heat. If you’re getting married in the middle of summer, that short dress is definitely a wise choice! It’s easier to move around. That gorgeous long train may be beautiful, but it does get a little difficult to move around after a while. Navigating all that fabric between tables and chairs can get very tiresome! Your first dance will look better if you can see your legs. A girl in a pretty dress, wearing pretty shoes, showing of her calves while she moves around the dance floor with the man of her dreams? That, my dear, is an extra special brand of gorgeous! If you’re thinking about going the shorter dress route but are worried about it being too unconventional, don’t. Just because it’s short doesn’t mean that it won’t still look like a wedding dress. Play with the idea. Have fun. And don’t forget to make those feet look fabulous!